For me, the green view in pro-mode could be zoomed in more .. depending upon the holes at my course, most all could be zoomed in 3-4 clicks (not necessarily to the max), to provide clearer view of the green ... like the SG-5 does. There are some things they just don't need to know...Yes, the skin is a soft rubber material and I have already made the cut in mine. You need to be very careful putting on or taking off too. I would definitely cut a hole for the usb. Already ripped one. Do the distance marks change for the green based on your angle of approach like on a Sky Caddie? I noticed in your pictures that the distance markers do not seem to be oriented from the fairway. I am trying to decide between the UPro and the SG5. The ability to get distances w/ your curser from anywhere on the hole is a great option on the UPro but I also like the distances to the green changing for your angle of approach on the SG5. These pics were in Preview mode ... from the tee box on a dog-left hole ..
Should be fine ordering directly from uPlay,from TGW, Golfsmith, Edwin Watts .. I bought mine frm ProtoGolf .. shipping was free and arrived within 2 days of shipping, but then I only live across the state from them. Thanx, nice screenshots. Haven't seen one in person yet so the visual examples are great. One discouraging thing I have noticed is that I have tracked the posted dates for Courses to become available on their website and in the last week all the courses I have tracked have moved back 1 to 5 months. Does anybody have any experience with requesting a course and it being done? As far as the courses being moved back, I have to say I may return my unit simply because I didn't mind waiting until the end of 08 to have my courses mapped but now other than my home course which I play about 50% of the time I will have to wait almost a year and half before my courses here in TN are mapped. I'm glad you brought this up because I saw that last night and now have felt a little mislead by them. I just don't see paying that much money and only being able to use it on one course for the next 16 months, minimum I'm sure. Definitely a deciding factor and major concern, course availability. If they get enough returns, maybe it help kick them into gear. I'm not sure how they decide what courses are priority vs others. So far, most of the courses I would play in my area are mapped (Florida) .. we'll see if they make their summer targets on those that I'm interested in. If those scheduled for end of this week get pushed back, I may reconsider keeping this myself. We'll see. Has anyone got any responses from emailed support issues? I've emailed one regarding the firewall and one with the suggestion list, but have not received any response, yet. An answer to a few lingering questions of this post. First you shoudn't have any problem ordering from other then upro directly. I ordered my unit from TGW with no issue. Regarding the MAC and course mapping issue, I sent an email last week with my concerns and actually received a call from Upro's customer service on a Saturday. Per the rep, they are still working on the MAC patch and were hoping to have it ready today but no promises. You will have to regester your unit on a PC first then download the patch from a PC. After the patch is downloaded you will be able to synch from your MAC. As for the courses being pushed back I was told the course dates listed are pretty much bogus at this point. They are mapping courses that users select as their home course first then courses that users have requested. they are planning/hoping that there is a lot of overlap in these requests between users so that cuts down the time. The home course I selected was not mapped so I requested it on Friday the 13th. Per the rep and site is should be done by this Thursday or they are sending me a free accessory. I aksed if I should plan on the course being mapped in time and this rep was very confident it would be done. As a side note my home course has an east and west on the same location. I asked if would they map both being that they are at the same location and the rep seemed to think so. Pretty shaky start so far but hopefully it turns around. Also asked if they could give some free credits for the inconvienence and he said he would see what he can do bot nothing as of yet and I don't plan on seeing any. Hope this clears some stuff up. You know I was thinking of returning the unit this am when I saw my courses target date had been moved back but then I called support and they are as nice and helpful as anyone could ask for. First, my soft case ripped and they are sending a new one at n/c. Second, they said they have a group of about 24 people mapping courses and they do about four a day. They then go to QA and a test machine and that because the mapping is so involved typically only a few get released each day and the others go back for needed changes. I asked about my courses other than my home course and he said the way it works is the crew comes in and takes the home course list first and works on those and then takes registered users requested courses next. So, the three or four courses I play and have now requested should be ready in the next 60 days, easily. That to me is very acceptable. I continue to have very good luck when calling them and getting an actual person who is always more than happy to listen and give me an honest answer, not just the answer I want to hear. To me this company is trying as hard as it can to get things done right and resolve the major issues. One other thing I forgot to mention is he said the blue power LED flashes when it acquired a signal. I said great but I think is should continue to flash or double flash when the unit goes into standby so you know its still on. He said he agreed. the home course i requested on Friday had a date of 8/19. It now has a date of 6/19 for both the course I requested and the sister course. this is a step in the right direction. Can't wait to fire up the unit and see what it can do. My home course now has tomorrow 6-18 on it so let's see what happens. I did go out to the one private course that is available and they let me walk around to see how it worked. The pro shop actually had the brochures and was waiting on there order. He said he had about 10 sold. On the course the unit does some really nice things once you get on the fairway. The screen is hard to see in direct sunlight though. 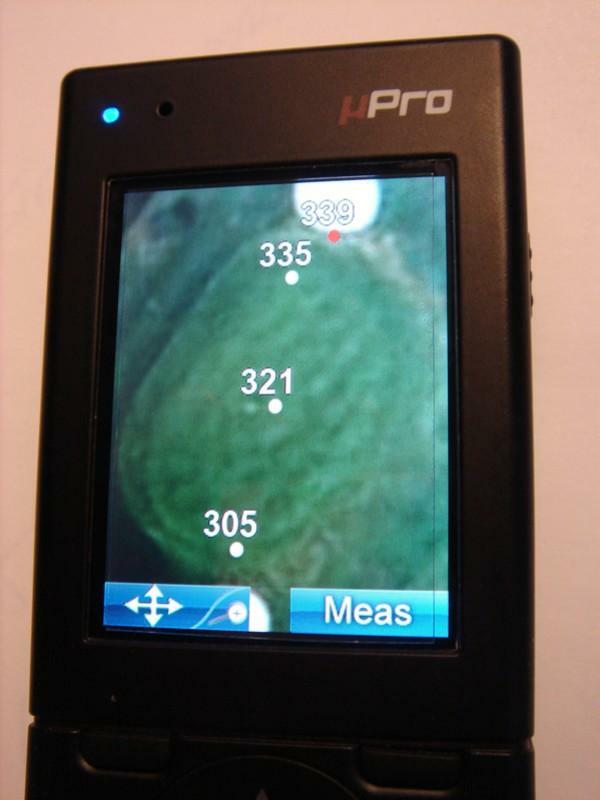 But showing all the yardages to all the bunkers or whatever in SmartView and the AnyPoint measurement tool is way cool. I didn't realize when you hit the measure button it marked your spot and as move the arrow keys to draw a line to your next shot if desired it automatically calculates the distance, very nice. I also didn't realize that in SmartView that the yardages change as you move about, it's real time. But the view of the green in SmartView does not rotate. It always shows the view from the front. If I missed something here please let me know. But I went to a bunker on the right side of the green and the view did not rotate for me. I had my SG5 with me as well and the yardages were always within a yard or two of each other. The Upro definitely gets better reception and seems to stay locked all the time no matter where you go. The signal bars never moved below the max of five. The SG5 was all over the place but never lost reception. Played again today. The battery saving mode is turning into a huge pain. There must be a way to stop it from going to that mode so fast. Other than that, and seeing pro mode in the sun, it's great. Also all the courses that switched to an 09 date have switched to a date no later than July 08. So it looks like those dates are forever going to change around. Do you remember if the green view in Pro-mode would orient for your approach? I thought it would and did for me, but I'm not sure that I remembered correctly, after VSMITH indicated it didn't for him. From the pictures you posted it appears that atleast the distance marks move and change based on your location. That to me is all that matters. if I am not mistaken that is what the Skycaddie does, change the approach angle and distance not change the orientation of the green itself? That to me is all that matters. if I am not mistaken that is what the Skycaddie does, change the approach angle and distance not change the orientation of the green itself? Not trying to thread-jack, but needed to correct the above. The SkyCaddies with Intelligreen (tm) technology do change the orientation of the green on the screen & the yardages - dependant on your POV. Looking at the green from the front/side/back & looking at the SC screen is the same. Sambo, I don't think it did. However, it wasn't something I was looking for when playing. The SkyCaddies with Intelligreen ™ technology do change the orientation of the green on the screen & the yardages - dependant on your POV. Looking at the green from the front/side/back & looking at the SC screen is the same. Thanks for the clarification. If you notice I put a question mark because I didn't know for sure. 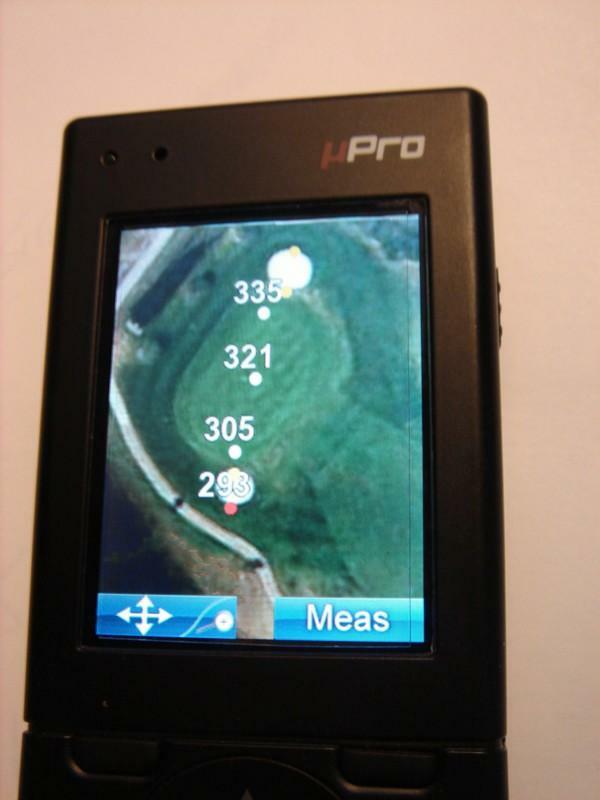 I am trying to make a decision between the SkyCaddie and the Upro and have no bias one way or the other. I have never used either device and am looking at places like this forum to try and make the most educated decision possible. The difficulty is that I think either option is good option with both having benefits over the other. I have already complained on the battery saving mode and was told if the unit stayed on all the time it would last for about 7 holes. But, I like you hate that option and to have the thing cart mounted would be a real pain. I typically leave my SC in the cup holder when I play 9 and cart mounted when I play 18. I like just looking at the unit and not having to pick it up to hit a key to turn it on. I'm thinking of ordering the belt holder...anybody seen it yet. I don't think the picture is on the site at this time. I wouldn't mind if it kept updating distances in saving mode. Seems trivial, but when I hit the button I want to see my yardage. We also had it on high battery life, low batt life with 45 seconds may be better. We'll see next time. I have the SG4, SG5 and now the Upro. They are all great units (the SG5 is way better than the 4 in my opinion) but the SC's on at least the courses here in Memphis don't show all the hazards even though they are four star mapped courses. It seems like if you can see the hazard it isn't always marked, that includes water, sand or whatever. And it's not that way on every hole. I'm not sure of the reason for this and maybe somebody can shed some light on that but all I know is there is just a lot not listed in the Target view on the SC even though they are rated 4 stars. I really like the Upro as long as you don't mind the unit gong dark in a very short time, the direct sunlight hitting the screen is almost unreadable but putting your hand around it helps. In the shade, cart or just not in direct sunlight the display was fine for me. I personally think the SC has a more sold feel but it is noticeably bigger and heaver and I like the buttons on the SC better as well because they are all on the front on the unit. The Upro Pro button doesn't have great feedback but if you press on the lower half of the button that does help. It's a tough call between the two units but for me the Upro is the one I will be using if the course is available. For me, a picture is worth a thousand words and that being the Upro's Arial view vs SC Target view. I do like the Mark function on the SC better. You can mark it, hit mark again and watch the yardage go up as you go to your buddy's ball then continue on to your ball. The yardage keeps calculating. The Upro just does a "start / stop" if you will as someone has already indicated on this forum. I hope this info helps you out somewhat. FYI: My home course was mapped early this morning and that did meet the 4 day guarantee. I went by the course and showed it to the pro and he really liked it and gave me a free round with cart for getting it done. That is worth about 40 bucks here. As far as the auto off feature, you will notice it takes no more than two seconds for it to recalculate your yardage when you get to the ball. As mentioned by Gsco the gps is off when the unit is in standby which as we all know by now happens pretty quickly. I ordered the belt clip holder to see how that works. I don't think its the button kind like on most cell phones that rotates but a holder or cradle type that may not rotate. Any thoughts on that or anybody seen one? The belt clip swivels, works best without the skin though. And yes, the yardage does show up after a couple of seconds. I was commenting on one hole where I told my partner he was 168 yards out. He picked his club and then the yardage was 165, wait 164, and finally settled on 161 which was a different club. So, although the yardage shows up in two seconds, to get an accurate reading you'll have to wait until it totally sync's back up with the sats. Gsco - That sounds like the floating yardage issue you get with the SC as well. I just played 9 and can say that didn't happen to me today but I'm sure it will at some point. I can't believe they turn off the gps when the screen goes dark. I thought it was just a screen saver but it really is a sleep mode I guess. Anyway, overall I like my unit, you?